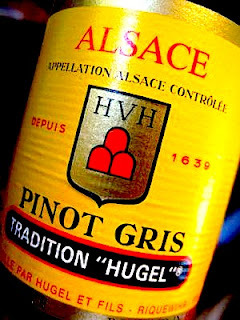 The family business Hugel making enormous efforts for the benefit of Alsace. The importance simply can not be over-rated. Etienne Hugel, who personalizes the Hugel spirit world-wide, markets Alsace wines worldwide, especially in Asia. The quality of all of Hugels' wines is high and increasingly better. The product line "Tradition" is made from grapes from their vineyards and are always fine wines with character and depth. The price is also very reasonable in relation to the high quality. Alsace wines of Riesling, Pinot Gris and Gewurztraminer need 5-7 years of storage before they enter the maturation phase, which lasts at least 20 years, and often up to 50 years. 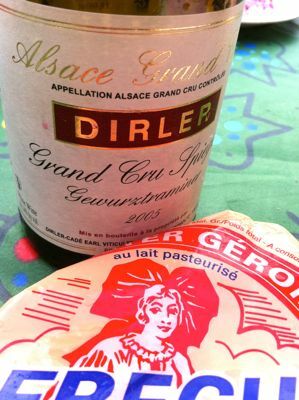 When white wines from New World, and sadly, even many expensive Burgundy from the 1990s and later, fall into pieces even "simple" Alsace wines just keep getting better with age, especially if they come from glorious producers such as Dirler-Cadé. 2005 Gewurztraminer Grand Cru Spiegel from Dirler-Cadé in Bergholtz is reddish yellow, with a complex aroma of orange, vanilla, ginger and maturation tones of leather. The taste is homogeneous, fresh and spicy with a refreshing acidity and a sweetness that begins to mellow and never takes over. The wine has almost no bitterness and is therefore perfect for a not-too-mature Munster Gerome. Price: € 15.